iPhone 8 comes with no native support for WMV files. This is why so many iPhone 8 owners like Anthony get stuck when they exert themselves to import WMV to iPhone 8, even though they have racked their brains. If you get a great many WMV videos and want to enjoy them on iPhone 8's 5.5-in screen, you need to convert WMV to iPhone 8 friendly format. Before this conversion from WMV to iPhone 8, let’s talk about the video format supported by this amazing iPhone 8. No.1 fast iPhone 8 WMV video converter for Mac to decode videos in WMV to iPhone Xs/X/8/8 Plus/7/6s etc with 5X faster speed than any competitor (GPU HW acceleration support). - MPEG-4 video up to 2.5 Mbps, 640 by 480 pixels, 30 frames per second, Simple Profile with AAC-LC audio up to 160 Kbps per channel, 48kHz, stereo audio in .m4v, .mp4, and .mov file formats. All Anthony need is a professional Mac video processing software. But choosing a worthy one is not as easy as you imagine. Every time Apple launched a new iPhone generation, there will be hot waves flooding over the Internet, so is iPhone 8 related software, e.g. video converter for iPhone 8. Well MacX Video Converter Pro comes as a trustful app, enabling you to convert video to iPhone 8/8 Plus, iPhone Xs/X/7/6S/6S Plus/6, iPad, iPod, Samsung Galaxy S9/Note 9, etc while holding excellent video quality. So when it comes to WMV to iPhone 8 conversion, it is like a hot knife through butter with this program. It gurantees the fastest WMV to iPhone 8 video conversion speed on macOS with the use of Intel's QSV/Nvidia/AMD hardware acceleration tech. 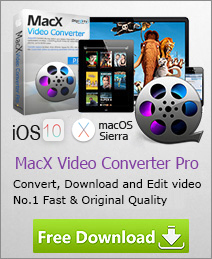 After free download Mac WMV to iPhone converter, click "Add Files" to load the WMV files. Also a Windows (10) version is available for PC users. Choose "to iPhone" as output format. MacX adds a new profile for Apple iPhone 8. Therefore, you can feel free to import any video to the six-generation iPhone. The last step is to kick off the WMV to iPhone 8 conversion on Mac. Click RUN button and the rest will be finished automatically. Note: the enhancement of YouTube downloader utility in this No.1 fast video processing tool is a great leap, enabling you to come through the latest YouTube encryption technology. That is to say, you can deal with any YouTube videos and download them on your Mac as you please. For those who want to appreciate DVD movies on iPhone 8, MacX DVD Ripper Pro works like a charm to get all things done.